You can view David's cartoon here, plus read reactions. Read my earlier posts about banning plastic bags in Seattle here. There has been a flurry of media coverage on California's effort to ban statewide the use of single-use plastic bags. Of course, here in Seattle we tried to impose a use fee on both plastic and paper bags but voters overturned the Council's decision after a massive, million dollar hoodwink campaign by the oil industry. I've blogged about all this before. I believe it's time to take another look at this issue. It's time for Seattle to ban the use of single-use plastic shopping bags. An outright ban! (We should exempt those plastic bags we all use at the grocery story to hold fresh vegetables, meat, fish and ice cream.) 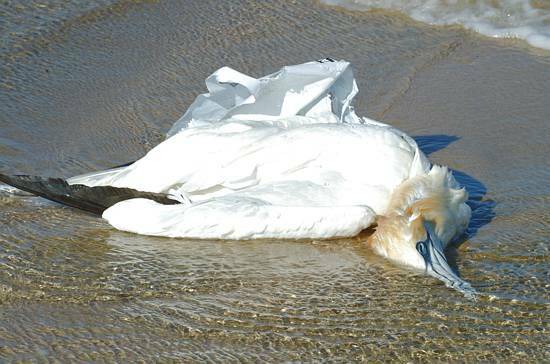 Plastic bags contribute to litter, they accumulate in our oceans and harm marine life, and they cause a negative drag on our forests. We need bold, decisive action, we need to demonstrate leadership on this issue and that's what I intend to do. Here are some good background resources for our discussion about banning single-use plastic bags in Seattle. Plastic Bags Are Killing Us from Salon.com on August 10, 2007. Are Plastic Grocery Bags Sacking the Environment? from National Geographic on September 2, 2003. We will know in a day or two whether the citizen initiative to repeal the green fee will qualify for the ballot, but here is an article that helps put this issue into perspective. I've written previously on this topic here and here. I voted with the majority of my colleagues on Monday this week to pass two environmental stewardship laws. Seattle becomes the first city in the nation to use market forces to encourage residents to stop using disposable plastic and paper bags in favor of reusable bags by creating a voluntary "use" fee. Each time a shopper chooses to use disposable bags at the check-out counter of grocery, convenience, and drug stores a $0.20 fee per bag will be imposed. This fee does not apply to plastic bags used for vegetables, bulk items such as nuts or candy, meat freezer bags, or pharmacy prescriptions. The new plastic bag fee takes effect January 1, 2009. An estimated 360 million disposable bags are used in the city each year. The "use" or green fee is expected to reduce use of disposable bags by at least 50%. The fees will be used by the city to offset a portion of upcoming solid waste rate increases associated with the new city garbage contracts and also to support the city's waste prevention and recycling programs. We also voted to ban the use of expanded polystyrene (commonly known as Styrofoam) food containers usually used for take-out food or restaurant leftovers effective January 1, 2009. We voted to delay a similar ban on plastic tableware and polystyrene meat trays. Read The Seattle Times and Seattle PI editorial support for passage of these laws. These laws are a good example of how government can help the market to implement necessary environmental change. I supported the voluntary bag "use" fee because it maintains the ability of consumers to choose whether to use their own reusable bags or pay a fee for disposable bags provided by the store. This is a market-driven strategy to help protect our environment. I believe we will adapt our behaviors related to plastic bags as well; I know I'm trying to do that. I've placed reusable bags in my car trunk and in my scooter's storage box. I've almost got it down, although just last week while standing in the grocery check-out line I realized I had forgotten to bring my bags inside with me. I froze in a near panic. What to do? The person in front of me had nearly completed paying for her groceries and I would be next. I imagined the hordes behind me starting to point and scream. "Get moving!" "What's the hold-up?" "Hey, aren't you that City Council turkey who wants to put that bag 'tax' on all of us?" I quickly regained my composure, pulled out of line, rolled my cart to the vegetable aisle for safe storage and hustled out to my car to grab my reusable bags. Lesson learned, although I'm sure it will take a few more practice runs before the "bag grab" becomes part of my natural instincts.